Surfing the web for divine recipes, we found this lovely combination of Swiss chard, garlic, pine nuts, and balsamic vinegar. Even better, the blog is known as TasteSpotting, and they found this recipe on yet another blog, originating in a Martha Stewart cookbook. 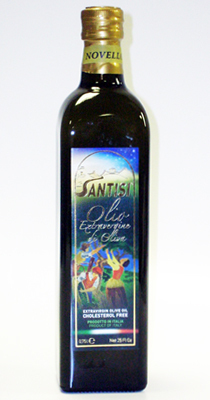 Nonetheless with excellent olive oil and balsamic vinegar from Olio2go, this is noteworthy! This will become a regular contorno (vegetable side dish) in our cucina! Kudos to Tastespotting for a great recipe. Any of the Villa Manodori selections will be great with this. 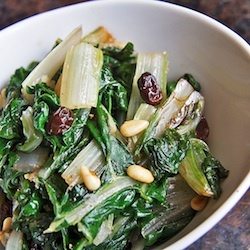 Swiss chard with basil and pine nuts is a traditional dish from Lazio. While spinach and chard can be used interchangeably, chard is a bit sweeter.